I don't use this product regularly, but it's great when I need a quick way to grind! I've also used it for grinding small vegetables into a shredded state, not just for coffee! Love this. I wish I bought this sooner. So easy to do. 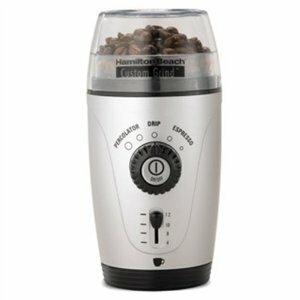 I love my Hamilton Beach Custom Grind Coffee Grinder. There is absolutely nothing like the taste of freshly ground coffee from whole beans and the smell is just heavenly! The HB grinder has settings to adjust the grind texture/size and I could not live without it! Once you try grinding your own coffee beans up fresh, you will not want to go back to buying pre-ground. The coffee is so much fresher this way.